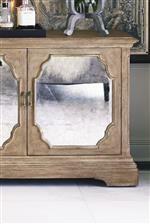 The Campania Armoire with Inset Antique Mirrored Glass by Bernhardt at Malouf Furniture Co. in the Foley, Mobile, Fairhope, Daphne, and Gulf Shores, AL area. Product availability may vary. Contact us for the most current availability on this product. TV Opening - Width 46"
TV Opening - Height 40"
TV Opening - Depth 16.375"
Finish Weathered Sand wood finish, with crushed stone accents in an Oyster finish complement, and a faux-stone off-white Bisque finish. 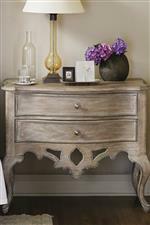 Handles & Hardware Decorative nickel-plated hardware in Antiqued Pewter finish. 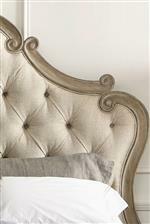 Case Detail Scrollwork, cabriole legs, canted posts, acanthus carvings, raised panels and carving overlays. Case Construction Premium white oak solids and veneers are hand-selected and matched to give a consistent look and finish to match each piece while enhancing the natural beauty of the wood grain. 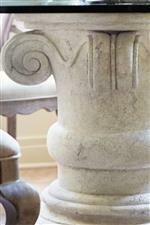 The Campania collection is a great option if you are looking for Traditional furniture in the Foley, Mobile, Fairhope, Daphne, and Gulf Shores, AL area.